Reinhold Messner, who was born in the Funes Valley of South Tyrol, has said, “The Dolomites are the most beautiful mountains in the world.” Being the greatest mountaineer of all time, we can trust Messner to know a thing or two about mountains. The Dolomites, a Unesco World Heritage site in the northern Italian Alps, are indeed a superb playground for all hiking lovers. With their vertical walls, sheer cliffs, and pale colored peaks, they make for some of the most breathtaking mountain landscapes in the world. 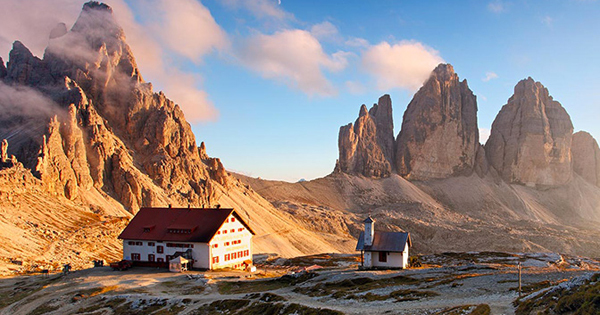 Below are five day hikes in the Dolomites that will give you a good introduction to their beauty. The Brenta group is the westernmost part of the Dolomites, located in the Trentino portion of the region (it is the closest group to Pineta Hotels; in fact, our hiking guide Livio often organizes day hikes in the area; Monte Peller is a favorite!). The hike we selected takes you from the lively mountain resort of Madonna di Campiglio to the Rifugio Brentei (rifugio = hut), positioned at the center of the rocky amphitheater of the high Val Brenta, right in front of the imposing north wall of the Crozzon di Brenta, in the Adamello-Brenta Natural Park. Take the ‘Sentiero dell’Arciduca’ in the woods up to the Vallesinella Hut; continue on trail no. 317 to Rifugio Casinei, and from there on trail no. 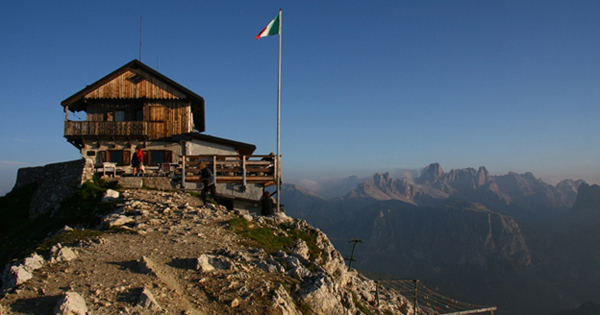 318 until you reach Rifugio Brentei (2,182 m, open mid-June-end of September). Tour duration: approx. 4 h 30 min. The Tre Cime di Lavaredo, part of the vast Dolomiti di Sesto in the South Tyrol portion of the region, are possibly the Dolomites’ most famous peaks. The circular trail that allows to see them up close is a must among day hikes in the Dolomites, but beware, it will be crowded in the high season, so if you can, avoid going in the height of summer. Starting point is Rifugio Auronzo (2,320 m), reachable by bus or car (7 km from Lake Misurina, toll road). Follow trail no. 101, which leads along the southern slope of the Three Peaks to Rifugio Lavaredo (2,344 m). Proceed to Forcella di Lavaredo, where the view over the north side of the Three Peaks is magnificent. Continue at the foot of Mount Paterno until you reach a junction; take the trail to Rifugio Locatelli (2,438 m). Continue along trail no. 105 for the Lange Alm cottage passing at the foot of the west side of the Three Peaks, finally returning to Rifugio Auronzo. Tour duration: approx. 6 hours. 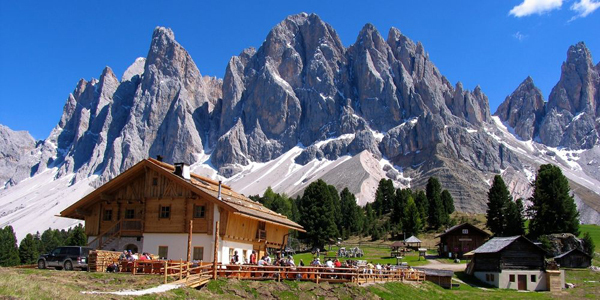 In the Funes Valley of South Tyrol, this is an easy trail that offers marvelous views of the Odle group of the Dolomites as you walk right beneath their peaks. Starting point is the parking lot at Malga Zannes/Zanser Alm (1,685 m), which you can also reach by bus. Take trail no. 6 towards Ciancenon/Tschantschenon until you reach the bridge. Turn right and follow the Adolf Munkel Trail, No. 35 all the way to Malga Brogles (2,045 m), where you can stop for a delicious lunch of typical South Tyrolean fair such as canederli/knodel and kaiserschmarren. For the return trip, take trail no. 28 descending to Ranui, where you can catch the bus. Chic Cortina has long been a favorite destination in the Dolomites. 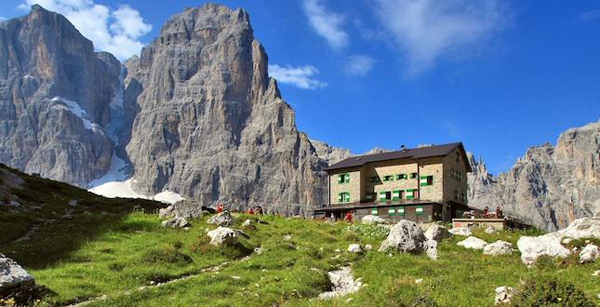 This hike takes you to the oldest mountain hut in the Dolomites, Rifugio Nuvolau, built in 1883. Leaving from Cianzopè (1,732 m), follow trail no. 439 among a wood of fir and larch trees to Rifugio Cinque Torri, where the view encompasses peaks higher than 3,000 meters such as Sorapiss and Antelao. As you continue to Rifugio Averau, you’ll be accompanied by amazing views of the Cinque Torri, Tofane, Lagazuoi and Cime di Fanes. Proceed on trail no. 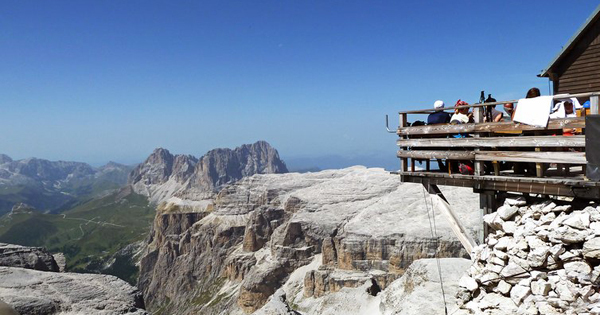 439 to reach Rifugio Nuvolau (open mid-June-end of September), where the breathtaking view opens up onto the entire Cortina d’Ampezzo basin, the Giau Pass, the Civetta group (3,220 m), and the famous Marmolada (3,342 m), nicknamed ‘the queen of the Dolomites”. Tour duration: approx. 5 h 30 min. This is one of the most spectacular day hikes in the Dolomites; it takes you across the Sella mountain range to its highest peak, the Piz Boé, 3,152 m.
Start at Passo Pordoi (2,240 m) above Canazei in the Val di Fassa; take the cable car up to the 2,947-meter-high Mount Sass Pordoi. 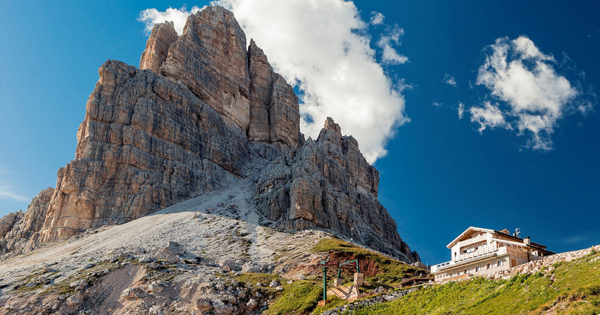 Follow the trail up to the Pordoi mountain pass, where the easy – and popular – trail no. 627 towards the Rifugio Boé begins. Traversing a moon-like landscape, you reach Rifugio Boé via trail no. 638. From there, it’s a steep hike to the peak of the Piz Boé (some sections are secured by ropes) and the tiny Capanna Fassa hut. The 360° view over the surrounding Dolomites peaks – Fanes, Marmolada, Sassolungo, Odle – is outstanding. Tour duration: approx. 4 hours.